Hi guys, sorry for the lack of reports but the computer has been giving me a hard time and wont connect to the internet so contact has been minimal. I will never understand computers, just as you think you are on top of them they go crazy and let you down-bit like women really. The duck shooting over the weekend was awesome with plenty of ducks hitting the deck and safely in the freezer bagged up and ready for a dinner party. 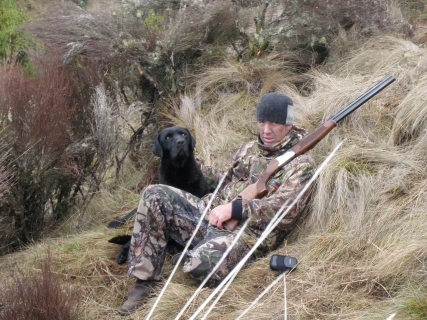 Funny enough the Tongariro this week is chockers with stray ducks taking refuge away from the hunting grounds. I have been on the river all week and the river has been nothing short of awesome with some absolutely top notch fish coming out. This river is fishing the best at the moment with plenty of fresh fish getting about and the added bonus of catching a big brown. The key to glory is still to keep moving and don’t get stuck in one pool all day as we have caught fish right throughout the river usually within the first ten casts. At the start of the week I spent a fantastic day with Nikki and Kurt from California which have been looking forward to exploring the Tongariro for quite some time. They are good friends of another client of mine and I really appreciate the word of mouth referral which always seems to be the best way to secure more work. We fished the true right of Judges and it was not long before Kurt was hooked into his first fish which happened to be his personal best of 4lb. The wind was terrible and made for hard casting for both clients and to tell you the truth I’m gladÂ I was not on the end of the rod so we moved up river after lunch and tried to find some sheltered water. I must add in all that Nikki actually pulled two more silver fish from the head of the pool using bright orange glo bugs-go girl. Things were not getting much better with the weather but the gutsy Americans saw the day out and enjoyed the river for what it is. They both agreed that they would love to come back next year and tackle the Tongariro Rainbows as they were fascinated with the power and strength of our fish and the scenery that we are able to relax and fish for them in. The last couple of days I have spent with Paul which has been staying at the best motel in Turangi and has been reading all about the Tongariro and what it has to offer through both of our websites so I crossed my fingers for some good luck. Paul has previously fished in the UK for fresh water fish with a maggot and a float so fly fishing isÂ a new experience to him and one that he has managed to pick up very well. The first morning was upon us and we found ourselves in one of my favourite spots very early with aching cold hands and toes as the frost was heavy and the skies clear. I demonstrated to Paul the correct way to nymph and explained where and why to put flies to certain parts of the river to better the chances of a hook up and it was not long before he was punching a reasonable line into a stiff cold breeze. After ten minutes I left the river to thore out and watched Paul flogging away in the margins of the pool thinking that he must be frozen and we should have stayed in bed at-least for another hour so the sun was on the water. “Snag” was the call from Paul and as I slowly made my way to the waters edge he changed his opinion to “!@%^? it’s moving” straight away I knew he had hooked into a solid brown as the pool has been producing them lately and after catching a few you really pick up on there behavior when hooked. They areÂ a totally different fish toÂ a Rainbow with no head shakes or blistering runs but just a solid continuous pull wherever it might want to go. These fish are so unpredictable and as usual this one had us on our toes and running down the rapids, crossing the river and wishing that we had not had that last can of beer the night before. The fish surfaced with it’s tail out of the water and that was a good sign that Paul had hooked ontoÂ a fish worth getting wet for-even at 7 30 in the morning. After being pulled down one set of rapids, crossing the river and at least a 20 minute tug of war I managed to get into a possession in the middle of the river while being up to my armpits in cold running snowy water to net it and secure the fish. I have never seen a client so pleased for himself and so surprised of what he had just achieved in his first hour on the Tongariro river. It was truly a great moment in my guiding career and one which I will not forget as this is why I do my job with so much love-just to see the pleasure on clients faces. It was great looking jack with awesome spots and the most mean looking face and giant hook jaw-a fish to be proud of Paul. I still cant believe the amount of browns that I have come across in the last two months but if you know where they like to lay and what they like to eat you can target these fish relatively successfully. You will ask me whats the secret fly, well that’s simple and there is no secret as it is the common orange glo bug in a size #14. I know some of you don’t believe that browns take glo bugs but the last few weeks have proved that they in fact love them-try one next time your out. AfterÂ a long walk around the river to show of his catch myself and Paul marched back to TRM for the official weigh in and a cuppa to warm the body which was now soaking wet and very cold as usual. The beast weighed in at 7.5 lbsand probaly lostÂ a pound or two on the way back-well thats what were saying anyway. Ross was excited to see such good fish still coming out and told Paul to go catch his girlfriend and get a perfect pair , we joked at the thought and jumped in the truck to head to my next top secret spot which has produced fish all year andÂ holds good numbers of browns in certain parts of it (slack water). This next pool isÂ a beauty and quite hard to get to without a decent walk but with a strong client a safe wade is possible but you must have your whits about you as the rapid is long and fast and washes into a swirly mess as it enters the next pool. The wind was still terrible and blowing straight down the river which made nymphing hard for Paul as he is a total beginner remember and had only ever wetlined before with moderate success. I felt for the poor bugger struggling away but knew he would not care if he didn’t see another fish for the two days as he had caught the biggest brown trout he had ever seen. Things were looking pretty grim as the mist rolled in and the clouds threatened until Paul screamed “I’m on” and with a shake of the head line peeled through the eyes of the rod and I started instructing Paul on how to play his fish. After the excitement had slowed and we had the fish in a position that favoured us it started acting very much like another big brown-pretty much it had just woken up!!! Oh no here I go again, sure enough the bugger headed to the otherside of the river as Paul scrambled down the bank trying to remain side onto the fish and get the weight of the thing into the quieter water where the fish could not use the current to it’s advantage. There I was wading deeper and deeper trying to get the first shot at the fish to try and prevent the brown rolling down the long fast rapid only to forget about myself going down again. Paul applied the correct pressure at the right times and with me screaming guidance from half way across the river the fish made a vital mistake of floating on the surface and I was able to slip the net under the 6lbs of Tongariro Brown. Yahooing could be heard from as far as Tasmania and another massive smile was spread across a very lucky mans face. What an introduction to fly fishing-it’s all down hill now Paul. Just toÂ make things short guys as I know this has not been written very well, it just goes to show you that you neverÂ know what you are going to encounter when fishing and that you will never encounter anything if you dont get out and have a go.Â Over the past two days Paul has caught and landed heaps of fish from all over the river using small naturals and glo bugs. Even though the weather has been terrible with wind we have just adjusted where we go and how we fish, the Tongariro is so versatile that it can be fished in any conditions. The biggest key is to keep moving , I cant stress this enough and the sooner you get moving the sooner you will appreciate the charm and charisma of the mighty Tongariro. Rain and snow is on the way so we should see plenty more good fish push up for the weekend so maybe if you have not got plans give old Ross a ring and get some accomodation sorted and maybe you can experience what Paul has over the last two days. It was a pleasure to fish with you Paul and I certainly wish I had your luck all the time, maybe you could guide part time for me ? ?